A Western spokesperson on Thursday afternoon told Inner City Press that "the text may change before six pm." French Ambassador Gerard Araud came out and predicted “one than one” abstention. But would Russia (dare) veto? Russian Ambassador Vitaly Churkin had emerged from the Council Wednesday night complaining about being portrayed as obstructionist when he had made a proposal for a resolution calling for a ceasefire, under Chapter 7 of the UN Charter. When Inner City Press on Wednesday night asked Susan Rice why, she said the previous Council resolution 1970 had already made such a call, which Gadhafi had ignored. On Thursday morning, Araud made the same critique of the Russian proposal. While some had speculated that Araud's announcement Thursday morning that France was calling for a vote at 6 pm was based on the travel schedule of new French foreign minister Alain Juppe, who decided on Wednesday to fly to New York. Rice herself refused to make any predictions of the 6 pm vote, saying she is superstitious. She was wearing a green jacket: it is, after all, St. Patrick's Day. Watch this site. UNITED NATIONS, March 16 -- On Libya, Russia offered a ceasefire resolution and offered “Chapter Seven” of the UN Charter, Russian Ambassador Vitaly Churkin told the Press on Wednesday evening when the UN Security Council meeting ended. Asked why other Council members did not all agree to the ceasefire proposal, Churkin told the Press that Russia does not describe other countries' positions, and to ask them. Inner City Press asked US Ambassador Susan Rice to explain opposition to Russia's ceasefire proposal. She said that there was a need for enforcement action, and that a call to end violence was already in the Council's previous Resolution 1970 on Libya. A Western spokesperson emerged and told the Press that since this earlier Council call for a cessation of violence had no effect, the Russian ceasefire resolution would have sent the wrong signal. Asked if the US now supports a no fly zone, Rice said the US is looking at a package that includes a no fly zone but goes beyond it. Rice did not list Arab countries which have offered to enforce a no fly zone. 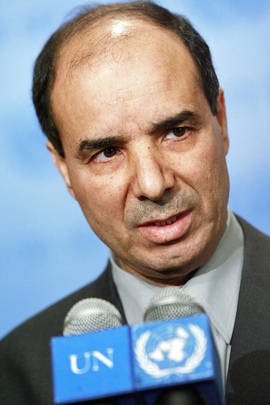 Ibrahim Dabbashi, the diplomat for Libya but not Gadhafi, said there are five such countries. Inner City Press has heard of four: Jordan, Saudi Arabia, the UAE and Qatar, whose Permanent Representative and presumptive next President of the UN General Assembly came to visit the Council consultations on Wednesday, accompanied by a bodyguard. Accused of filibustering, Churkin denied it, saying this is not the US Senate or House of Representatives. To some the proceedings have the aura of a blame game. Russia can now argue that it is not obstructionist, it offered a ceasefire resolution which was rejected. The US can explain what many saw as its indecisiveness about calling for a no fly zone by saying that it wants MORE than a no fly zone. And if Russia somehow blocks such a proposal -- the deployment of a veto seems unlikely -- the US could blame Russia for being obstructionist. In the background, countries like India and even Germany have expressed reservations or questions about a no fly zone. For now, Council members' experts will convene Thursday at 9 am, the Permanent Representative at 11 am. But what will happen in the next 13 hours in Libya? Watch this site.